This is from A Moment of Cerebus website. Creator's Rights Discussions / "Bill Finger's granddaughter speaks out after DC's WonderCon remarks..."
ATHENA FINGER RESPONDS: "75 years of Batman! No one could have predicted the longevity and the continued relevance of this comic book hero that has become a cultural icon when my grandfather, Bill Finger, collaborated with Bob Kane back in 1939. My grandfather has never been properly credited as the co-creator of Batman although was an open secret in the comic book industry and is widely known now. It is now my time to come out of the shadows and speak up and end 75 years of exploitation of my grandfather, whose biggest flaw was his inability to defend his extraordinary talent. Due to what I feel is continued mistreatment of a true artist, I am currently exploring our rights and considering how best to establish the recognition that my grandfather deserves." Reed Expo, which sponsors the New York Comic Con every year at The Jacob Javits Center, is doing a smaller version of the convention this June at The Jacob Javits Center called Special Edition: NYC. They asked me to participate in the convention. So, I’m putting together a panel titled "Creator-owned Comics (vs. Corporate-owned Comics)." The Special Edition: NYC convention will be Saturday, June 14 to Sunday, June 15. I don’t have the exact time and date for the panel, but I’m supposed to be receiving that info by May 19th. If you‘re going to be attending the convention, then feel free to stop by to check out the panel. There seems to be more and more comic books owned by the artists and writers that create them. We have Image Comics, Dark Horse Comics, and self-published comics. The creators that make such comics don’t have to answer to an editor. They can write and draw the kind of comic books that they want to write and draw. This is much different than the work-made-for-hire comics that are being published by the likes of Marvel Comics and DC Comics. Has the advent of digital comics helped creators make their own comics? Is self-publishing a viable alternative for creator-owned comics? Does the freedom of webcomics play a part, as well? What’s the future of creator-owned comics compared to corporate owned comics? Do the readers gravitate to comics based on the creators? And how can aspiring artists and writers get in on the action of creating their own comic books? AN ACT OF FAITH #8 will go on sale next Wednesday (May 7th) through iVerse Media. 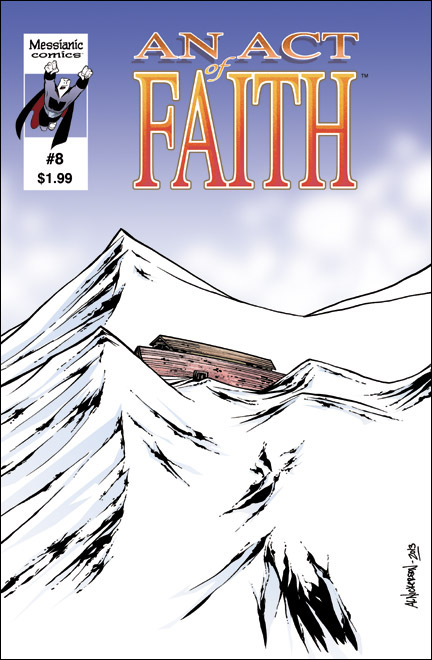 AN ACT OF FAITH #8 is scheduled to go on sale Wednesday May 7th, through iVerse Media. AN ACT OF FAITH #8 begins the two-part "The Ark" storyline. It’s 1984 and Professor Jack leads a team of super-heroes in search of Noah’s Ark. Will the team locate the Ark? (And while we’re on the subject, does the big boat even exist?) Find out why the expedition becomes Professor Jack’s worst mistake and what all of this means to Nemish-Man, Crusader Girl, and Kid-Cockroach. Learn all about the origin of the mysterious Ninja Spider! Special Bonus: Al Nickerson and Dave Sim’s recent correspondence concerning Dave's work as a comic book cover artist. "The Ark" Part 1 is an excellent jumping on point for new readers. I was interviewed by Christian Comic Books in "I Interview Al Nickerson!!" In the interview, I discussed AN ACT OF FAITH and my career in comics. There’s even some previews pages to AN ACT OF FAITH #8 (which goes on sale in April). This is the third and final part to "The Return of the Green Knight" storyline. (Next issue, ish #8, begins "The Ark" storyline.) There's even more preview pages of this issue at iVerse Media. 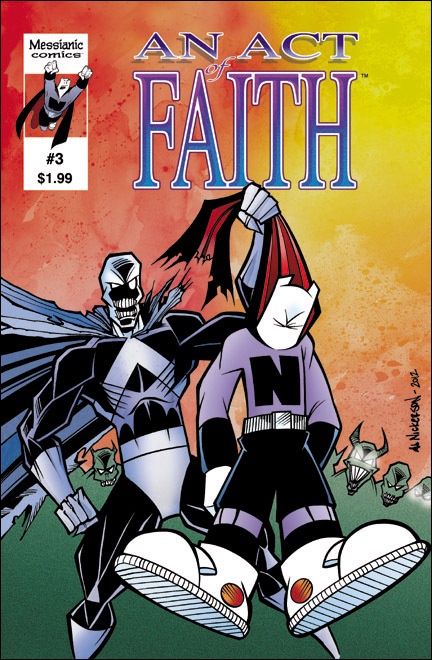 Here's the solicitation for AN ACT OF FAITH #7: "Nemish-Man and Crusader Girl go to Hell!" series, AN ACT OF FAITH. These videos are impressive, and so very flattering. 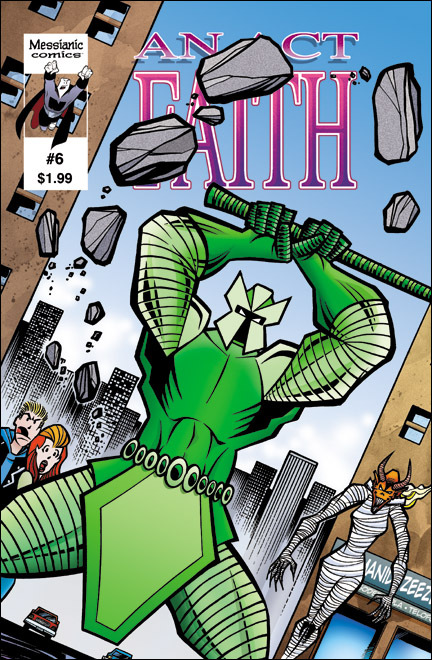 Here’s the solicitation for AN ACT OF FAITH #6: "AN ACT OF FAITH #6 is part two of the three-part "The Return of the Green Knight" storyline. Can Nemish-Man, Crusader Girl, and Kid-Cockroach realize that Lilith is manipulating the Green Knight, and save Urban City from the destructive fury of the indestructible knight of legend?" 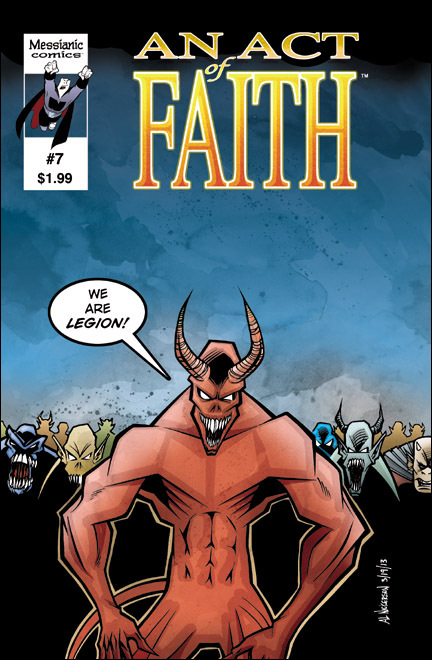 AN ACT OF FAITH #6 should be on sale this month (November) through iVerse Media.